When most people think of corporations and corporate taxes, they think of a company with shareholders, and buying and selling stock. But that's only one form of corporation, called a C-corporation in tax law. There are also corporations that don't issue shares of stock to the public. This category includes sole proprietorships, partnerships, and what are called S-corporations. These are "pass-through" corporations, in which the income earned by the corporation goes straight to the owners, and thus is taxed under the personal income tax rather than the corporate income tax. The pass-through sector of the economy is growing, as Aaron Krupkin and Adam Looney review the evidence in "9 facts about pass-through businesses" (Brookings Institution, May 15, 2017). As they explain, "Of the 26 million businesses in 2014, 95 percent were pass-throughs, while only 5 percent were C-corporations." But most businesses are very small: for example, 41% of those 26 million businesses were sole proprietorships. Moreover, 99% of all companies and 95% of C-corporations had receipts of less than $10 million. 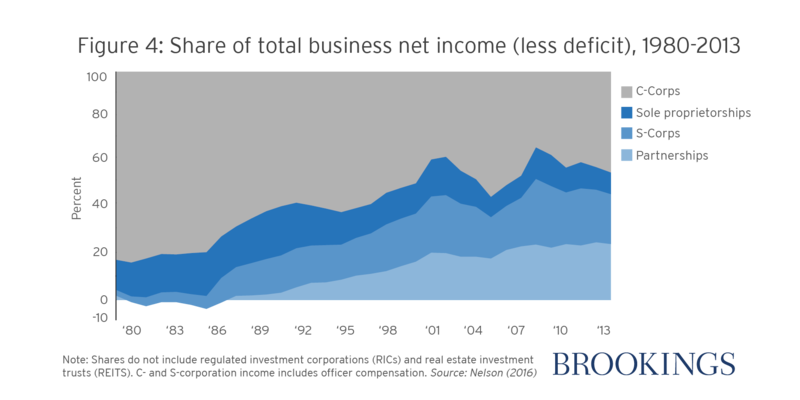 The share of total business income in C-corporations is falling, and share in partnerships and S-corporations is rising, to the point where pass-through corporations now receive more than half of all business income. The tax rules are different in a variety of ways across these corporate forms. For example, if you receive a payment from a company for your labor, you owe Social Security and Medicare payroll taxes on that amount, but if you receive a share of profits, then then you don't owe those payroll taxes. The decision about what is a payment for labor and what is a share of profits contains a large element of discretion. Thus, substantial time and energy goes into finagling the legal structure of the corporation, in part to take advantage of tax differences. "While they are not “pass-throughs,” many closely-held C corporations in which the owners are also managers share certain similarities with pass-throughs and, in practice, the income of their owners is often taxed much like that of sole proprietors. Owner/managers of closely-held C corporations often pay themselves wages, which are deductible from corporate-level tax, in lieu of dividends, which are not. This way, they maintain the limited liability and legal benefits of incorporation, but avoid the two levels of corporate tax by receiving their income as wages. As a result, the taxes they face are more similar to general partners or sole proprietors than to, say, publicly-traded C corporations." Conversely, it is increasingly common for large firms to organize themselves as partnerships and S-corporations: indeed, there are now even hybrid forms like partnerships which issue stock that is publicly traded. "Large businesses are responsible for nearly all of the sales and profits of C-Corporations, and a substantial majority of sales and profits of partnerships and S-corporations. Among sole proprietorships, in contrast, only 9 percent of sales and less than 1 percent of profits came from large businesses. Most hedge funds, private equity funds, law, consulting, and accounting firms are partnerships; these businesses can be large, global enterprises. Indeed, in 2014, about a quarter of partnership business income was earned in finance, real estate, and holding companies sectors, and about 13 percent by law firms. With the advent of publicly-traded partnerships, a few pass-throughs are now owned by thousands of shareholders and trade on stock exchanges like public C-corporations. Similarly, large S-corporations compete directly with large C-corporations in industries like engineering and construction, trade, and professional services." In thinking about corporate tax reforms, it's important to remember that the shareholder-owned C-corporation is actually less than half of all business income. Any sensible reform has to take into account the entire universe of US corporations. Krupkin and Looney cite one prominent estimate: "According to one U.S. Treasury study, if the relative shares of pass-through and C-corporate activity were held at 1980 levels, the average tax rate on business income in 2011 would have been 28 percent instead of 24 percent. This translates to more than $100 billion in lost revenue in 2011 alone." In thinking about "corporations" more broadly, it's also important to remember there are huge differences between mega-giant C-corporations like Walmart, Apple, and ExxonMobil and the overwhelming number of other corporations out there--not only on the obvious dimension of size, but also in their legal form.